With its location in the picturesque Bregenzerwald Forest, Schwarzenberg is a popular destination for hiking holidays mostly among domestic and German tourists. A village with less than 2,000 residents, Schwarzenberg could preserve much of the charming aspects of rural Vorarlberg. It is considered among the nicest villages in the forest: Many old farm houses with wooden roofs in a traditional, local style have survived. The history of Schwarzenberg is about as exciting as you would expect it from a tiny village: The oldest written record dates back to 1270. It was part of the Habsburg′s private property ever since the Middle Ages and - like much of Vorarlberg - was administered either from Tyrol or "Outer Austria" (today′s Freiburg im Breisgau). Following the Napoleonic Wars, it was part of Bavaria between 1805 and 1814, after this period it went back to become a part of Austria, which it still is. End of the history. Schwarzenberg has few attractions beyond its general rural prettiness: There is a concert series held every summer called the "Schubertiade". For those who failed to understand the self-explanatory title: It is dedicated to Franz Schubert. More specifically, the series focuses on pieces by Schubert that are neglected elsewhere - which helped to secure a bit of a niche for "real" Schubert aficionados and summer tourism has benefited tremendously from the event. The other claim to fame for Schwarzenberg is cheekily derived from Angelika Kaufmann, who was born in Chur (Switzerland) in 1741 and died after an eventful life in Rome in 1807. The daughter of a painter became an artist herself and founding member of the Royal Academy of Arts. Little did she do in Schwarzenberg - which does not prevent the local tourism mafia to exploit her legend. She spent some rather insignificant years in Schwarzenberg, but did paint some of the frescos of the local parish church, the Dreifaltigkeitskirche. More significant pieces of art in the church were made by her father. The church is home to the remains of St. Ilga, a 12th century saint, of whom I have never heard before. The church is a rare example of Baroque buildings in rural Vorarlberg and was built after a fire in 1755. To explore more of Angelika Kaufmann and local traditions and customs, try the Heimatmuseum of town (village?) museum. 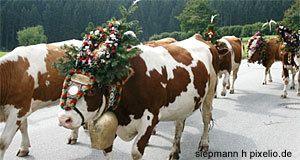 For hands-on folk culture outside of the museum, try to visit Schwarzenberg in mid-September, when the Almabtrieb is held on Alptag ("Alp Day"). This is a ceremony for which 700 cows are decorated in a manner not dissimilar from Christmas trees and led to the farms from the mountains, where they spent the summer. Almabtrieb ceremonies are held all over Austria, but the one in Schwarzenberg is supposed to be particularly nice to watch and combined with a market. The main square of the village, which is surrounded by listed buildings, makes a great venue for this event.